Michelle Daugherty is a young woman whose life has afforded her a gritty and honest view of the human condition. She connects her readers to a side of herself and then proves each case with detailed and vivid imagery. 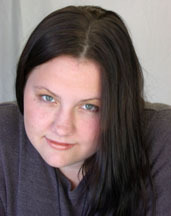 Michelle has studied under such poetic stars as Jeffery McDaniel, Michael C Ford and Brendan Constantine. Her work has been included in many anthologies including Beyond the Valley of Contemporary Poets 2005 (Valley Contemporary Press 2005), and It's All Good (2004 Manic D Press). She is the winner of a PEN West In The Classroom Award, and received honorable mention for her sonnet "Communion" from the New England Poetry Club.